By Jim Oleske of Portland, Oregon. Jim is a former labor attorney and legislative aide who most recently served as chief of staff in the Senate Majority Office during the 2007 regular session and the 2008 supplemental session. He previously served as counsel to U.S. Senate Democratic Leader Tom Daschle. "We have a disaster here"
"I weep for my children and their families"
These were the comments coming from conservatives in the wake of the second presidential debate last week. They represented the sentiments of fierce partisans about Sen. McCain's performance, but they sounded suspiciously similar to the sentiments of millions of nonpartisans about the modern Republican economy. This is not a coincidence, and even the McCain campaign admits that if the election is about the economy, McCain likely loses. Against that background of consistent support for the Bush economy, McCain faced an uphill battle in seizing the "new direction" mantle last night, and the post debate polls showed he fell far short with the independents he needs to win over in the next three weeks. But the full impact of the economic debate -- and McCain's admission that the modern Republican economy has failed -- goes well beyond November and will impact the type of presidency that will be possible for Sen. Obama should he win. Many progressives, here at Blue Oregon and around the country, are hungry for a transformational presidency in the mold of FDR. I share that sentiment, and I believe the critical first step to achieving our goal is fostering the same broad national consensus the country reached in the early 1930s -- that Republican trickle-down economics is, quite simply, a joke. That consensus gave FDR a great deal of room to maneuver as he laid out the New Deal, and a similar consensus will provide Barack Obama with the political capital he needs to fundamentally change our current economic policies. My small contribution to fostering that consensus is Yeah, Right, a new book collecting the short-sighted and out-of-touch statements made by the head cheerleaders for the Bush economy. 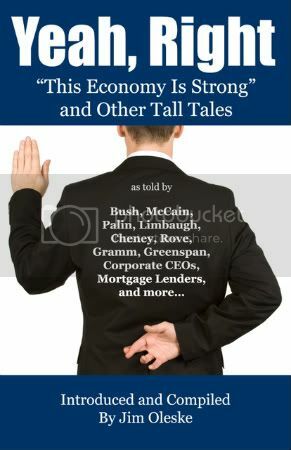 The book exposes the double-talk of leading Republican politicians and their corporate supporters, using nothing more than their own words and the striking juxtaposition of those words with the grim facts facing most Americans today. "The economy has done so well. It's the best performing economy ever on earth." "[T]he long-term fundamentals are very solid." The book is available online at YeahRightBook.com (free shipping on all orders), Powells.com and Amazon.com. It's also available at these local stores: Annie Bloom's, Longfellow’s, Powell's City of Books, Powell's on Hawthorne, Presents of Mind, St. John's Booksellers and Wallace Books. If you share my sentiment that exposing the joke of the modern Republican economy is essential to readying the country for fundamental change -- and if you think my book might help accomplish that goal -- I'd ask you to spread the word about Yeah, Right by emailing your friends about the book; posting a reader review on Powells or Amazon; or letting progressive organizations you work with know that bulk discounts of up to 40% are available at YeahRightBook.com. Sen. Obama is doing a fantastic job of exposing Republican trickle-down economics every day on the campaign trail as he emphasizes how the current crisis is "the final verdict on this failed philosophy." With your help, I hope Yeah, Right can play a small role in helping to reinforce that final verdict. The shifting of taxation to the middle class, the shifting of income from the working class to the investor class is over. The new reality of economic meltdown and collapse reveals the literal and figurative bankruptcy of the economic model of supply side economics and market fundamentalism we have lived with these past 38 years. Just as the Great Depression and FDR brought us a paradigm shift with the New Deal policies of soc. security, market regulation, labor protections, so the economic collapse of 2008 will bring us Barack Obama and a breakthrough to new economic paradigm. Bill -- the "paradigm shift" you mention is exactly what we need, and the path to getting there is achieving a broad national consensus (as we did in the early 1930s) about what you describe as the "bankruptcy of the economic model of supply side economics and market fundamentalism." This financial crisis is a direct result of the greed and irresponsibility that has dominated Washington and Wall Street for years. It's the result of speculators who gamed the system, regulators who looked the other way, and lobbyists who bought their way into our government. It's the result of an economic philosophy that says we should give more and more to those with the most and hope that prosperity trickles down to everyone else; a philosophy that views even the most common-sense regulations as unwise and unnecessary. And this crisis is the final verdict on this failed philosophy – a philosophy that we cannot afford to continue. Looks like good work, Jim. However, the changes in the 1930s were not just "brought to us by the Great Depression and FDR" or even "a broad national consensus." They were also brought by organized social and political movements & we have to step up the challenge to organizing and demanding. As Frederick Douglass famously said, "Power concedes nothing without a demand." Roosevelt's election in 1932 came 3 years after the stock market collapse of late 1929 met up with a much longer-standing agricultural recession/depression going back into the mid-1920s, when 40% of the population of the country was still rural (under 10% today) to produce a banking crisis that had been going on for perhaps two years by the time Roosevelt was elected. Progressive forces had been organizing and making demands and fighting back. Communists and other radicals were taking actions like intefering with evictions over foreclosures and rents and putting people back into their homes. 17.000 World War I veterans marched on Washington as "The Bonus Expeditionary Force" a.k.a. Bonus Army in mid-1932, demanding early payment of compensation for war service promised by law in 1924 but not scheduled for payment until 1945. After a period of encampment in shantytowns in D.C. the Bonus Army was viciously and violently attacked first by police, who killed two in the face of resistance, and then by several units the Regular Army under General Douglas MacArthur, including six tanks commanded by George Patton, killing several more, injuring hundreds, and torching the shantytown encampments. The Norris-LaGuardia act facilitating union organization by outlawing "yellow-dog contracts" that forced agreement not to join a union as a condition of employment in 1932, i.e. before the election; LaGuardia was the liberal Republican sometime Mayor of NY City though in Congress or the Senate at the time. This helped set the stage for the break of John L. Lewis' United Mine Workers and several other AFL unions to form the Committee for Industrial Organization, funding massive new organizing efforts creating organizing committees that became new unions in the Congress of Industrial Organizations, to organize workers in mass-production industries whom AFL craft unionists had regarded as unorganizable. They provided key political backbone for Roosevelt. A great many of the new unionists were second-generation children of immigrant parents who organized within neighborhoods generally close to factories, often using ethnic organizations as well as family networks. In parts of the upper midwest people formed Farmer-Labor parties to press Democrats. Populist forces gained power within white-oriented southern Democratic parties, while Negroes in the north (to use the contemporary name they preferred) shifted to voting Democratic and influenced officially non-discriminatory policies in the CIO (not always followed). There was widespread intellectual criticism of the crisis, influential radical arguments that capitalism itself was falling that created a great deal of intellectual space for social democratic and liberal proposals. There were popular leaders like General Smedley Butler and Huey Long who encouraged popular demands. These are merely examples and far from exhaustive. The question of "consensus" can be overstated. Roosevelt won by a landlide in 1932 with 57% of the vote and 472 electoral votes, but 40% still voted Republican (about 3% voted further left). Some of the forces against him like the Liberty League and the National Association of Manufacturers were not just opposed but strenuously to viciously so, and there were proto-fascist forces in play (and some of the populists, like Huey Long, while not reactionary like the racist & anti-semitic radio priest Father Coughlin, had strong-man potential in an age of dictatorships). On the other hand, conventional wisdom that "free markets" had failed, and always produced instability with deep immiserating depressions, was indeed widespread, and "economic planning" was highly regarded, even in places like Fortune magazine. The point about consensus though is that in this kind of context it does not mean "universal agreement to compromises acceptable to all stakeholders." It means very broad popular support. A great many of the New Deal programs were objected to strenuously by major "stakeholders," whose wishes were overridden by large majorities. The situation today is different. Our election is being held much closer to the beginning of the financial crisis. That's good in that the chance to minimize its effects remains. But as the confused politics of the bailout show, while things are shaken up, organized forces and clear demands about what to do are not yet developed. Senator Obama's deep commitment to bipartisanship and compromise remains to be tested when faced with situations in which there will be choices objected to by major stakeholders, whichever way they are made. Will Obama and a Democratic majority, if we get them, indeed pass the Employee Free Choice Act quickly, and will the organized labor movement take it up in a way to rebuild the political power of working people as well as their negotiating power with employers? Is that movement creative enough to move into the large swathes of service sector employment that remain untouched, as the economy has a new shape compared to the 1930s-60s just as that economy did to the 1890s? Will Obama and the Democrats be brought around to facing that the healthcare crisis cannot be solved by compromise that favors the insurance industry? If so, how will prospective job losses to insurance industry workers be handled? And so on. Another key difference is that in the early 1930s debates over social democratic and liberal policies (and at the other end, conservative ones) were shaped by the existence of power alternative ideas for different types of social orders, including Soviet communism and the fascism of Italy and Spain and the rising Nazi fascism in Germany. The absence of such seeming alternatives bringing radical challenges, forcing consideration of a wider range of ideas, and posing threats that put other proposals in a different perspective has no counterpart today. This is illustrated by the silly but widespread tendency of Republicans and other conservatives to characterize Barack Obama's positions, which are moderately liberal on some things and center-right on others, as "socialist." The function and to a large extent the point of that rhetoric, at least on the part of the intellectual ideologues who do really know better, is to try to police how far further left proposals may be made and be taken seriously. Cracking the debates open to go for deeper reforms and build a large majority quasi-consensus around them is going to take more than a crisis -- it is going to take organized movements, vigorous articulation of ideas, and linkage between them. Chris Lowes comment is important. Pressure from below facilitated Roosevelt's New Deal changes, just as civil unrest and the civil rights movement facilitated Johnson's civil rights and Great Society legislation. Unfortunately those recipients of the "free market" tax breaks under Bush consider those breaks an entitlement. To suggest that reducing tax breaks to the wealthy and shifting them to the middle class, is socialism - is poppycock. We have seen the greed which results from an unregulated "free market" economy and it aint pretty or productive. The Exxon's of the world have no incentive to develop alternative energy sources because their bread is buttered with petro dollars. With record earnings do they invest in living wages for labor, plant, or R&D efficiencies? No, they buy back stock and outsource. How do we provide incentives to major corporations to do the right things? Do we see any evidence of sacrifice from AIG and it's execs since the bailout? Quite the contrary it's high times as usual only now with tax dollars. We can all get behind the need to shift our focus to sustainable growth, but how many among us want to sacrifice the high life to get there? Thanks for the extensive feedback. I think your comment provides ample material for several future discussions here on Blue Oregon, and I hope we have them in the months ahead. I sense we would agree on much, but part company on some key points. I completely agree that the Republican economic crisis is not sufficient to deliver the fundamental change our nation needs, but I do believe it is a necessary prerequisite. As I said in the post, I think it is a "critical first step" to preparing the nation for the type of dramatic shift that will then require both dynamic leadership and the "organized social and political movements" you emphasize. I also agree that out situation today is different than the one the nation confronted in 1932 insofar as we are much closer to the start of the crisis. I'd like to share your optimism that this might give us an opportunity to "minimize its effects," but I suspect that the worst is yet to come in 2009/2010 no matter what we do, and there will be a massive, concerted Republican effort to blame Democrats, even though the past eight years of trickle-down economics made the coming crisis near-inevitable. Republicans did not have a similar opportunity to shift blame to FDR, as the Depression was already three-and-a-half years old by the time he entered office, and blame had been unalterably fixed with his Republican predecessors. Obama won't have that advantage, which is why I think it is all the more important that we use this time between now and January to cement a consensus about the failure of the modern Republican economy. In the end, I agree that we must invest time and resources in organizational efforts that will bring progressive policies to the fore. Indeed, the book I originally set out to write concerned the need for Democrats to more aggressively press economic fairness policies. But ultimately, I concluded that those policies -- and efforts on their behalf -- would have the best chance for success if we first achieved the broad consensus we did in the 1930s about the failure of the competing trickle-down model. Speaking of learning one's lessons OR NOT. Who has the power to insist that this Administration in its last few days does not install the Wall Street equivalent of Blackwater, and at those same kind of inflated prices? Did I miss this news out there in the general media? And: will Obama enforce translucence once he takes the reins? I expect everyone to engage immediately in robust fact-checking and advocacy once he's in. Get the most we can out of him by being an active and self-advocating electorate. I would like to know how that will even be done. Mr. Oleski? What is the TRUTH about functioning mechanisms for the communities to latch onto? WHere are the real efficacies? I mistrust what I see as anything more than community engagement that helps us have a better emotional quality of life. I do not see that it bears one whit upon those who run the show. Interesting post. I'm looking forward to reading the book! Hope you're doing well, Jim. I also agree that out situation today is different than the one the nation confronted in 1932 insofar as we are much closer to the start of the crisis. I'd like to share your optimism that this might give us an opportunity to "minimize its effects," but I suspect that the worst is yet to come in 2009/2010 no matter what we do, and there will be a massive, concerted Republican effort to blame Democrats, even though the past eight years of trickle-down economics made the coming crisis near-inevitable. If I conveyed optimism, I wrote poorly -- it's more like hope against hope, given the state of disorganization. Your suspicion almost certainly is correct. I see now a little better where you're coming from about the dialectic (if you'll forgive the term) between "consensus" on ideas -- a term that means something stronger to me than to you, I guess, so, using it on your terms -- and organizing. Personally I think the two kind of work together -- that unity comes from action, that persuasion about ideas often works best when it's oriented to action. But clearly I should read your book and not presume that you're saying any different. Good stuff.